KC Digital Drive is proud to announce that the 2016 Gigabit City Summit will return May 16-18 in Kansas City! With 50 communities and nearly 250 delegates in attendance, our first Summit was an unqualified success! And the overwhelming feedback from those who attended in January 2015 was that we ought to do it again. 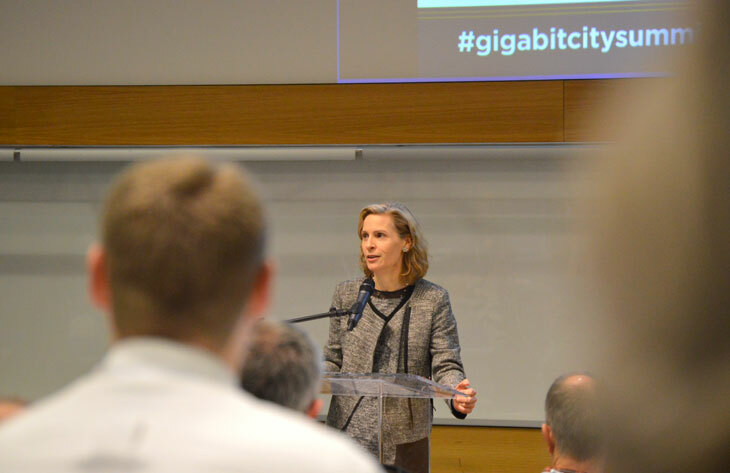 The Gigabit City Summit is the premier conference for leaders in cities that either have or are planning to build out gigabit fiber-optic networks. The “metro-delegation” model remains core to our approach, as we encourage cities to bring interdisciplinary teams of five members from government and civic organizations that share one thing in common: an interest in how emerging technology can be directed to shape the communities we want to live in. We’ll also address key questions around education, entrepreneurship, regionalism, public safety and mobility as we build future digital cities. Kansas City is becoming home to the largest Cisco Smart + Connected Communities project in America. The project spans a 2-mile route along a streetcar line under construction. Pending completion in time, we’ll hop on the streetcar and see the KC Living Lab up close! Register between now and Jan. 31, 2016 and you will save $200 on an individual registration and $900 on a metro delegation registration. That’s 30% OFF the regular price of $699 for individuals and $2,995 for metro delegations! Perhaps even a year-end budget surplus could pay for your 2016 registration before Dec. 31! The Gigabit City Summit is the only event where you can learn how your city and your metro can prepare for the opportunity to become a Gigabit City. The 2015 Gigabit City Summit brought 250 delegates from 50 U.S. cities to learn how Kansas City has seized its gigabit opportunity and to take back actionable lessons for their communities. If you missed out, here’s a roundup of content from and about the event. Nate Hill of Chattanooga Public Library and Bill Wallace of US Ignite look on attentively. Broadband expert Susan Crawford delivered one of the 2015 keynotes. Watch the videos. Visit our slideshare account for speaker decks. Check out US Ignite’s Storify of the social action. 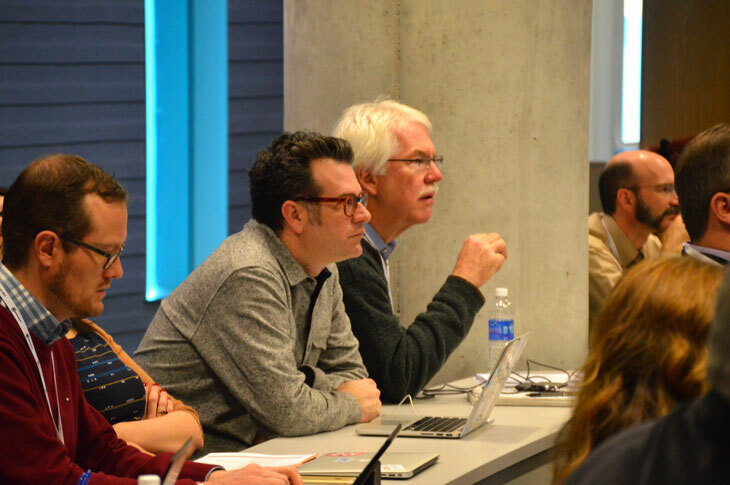 Read a guest column for the Portland Business Journal by conference attendee Skip Newberry, President of the Technology Association of Oregon. 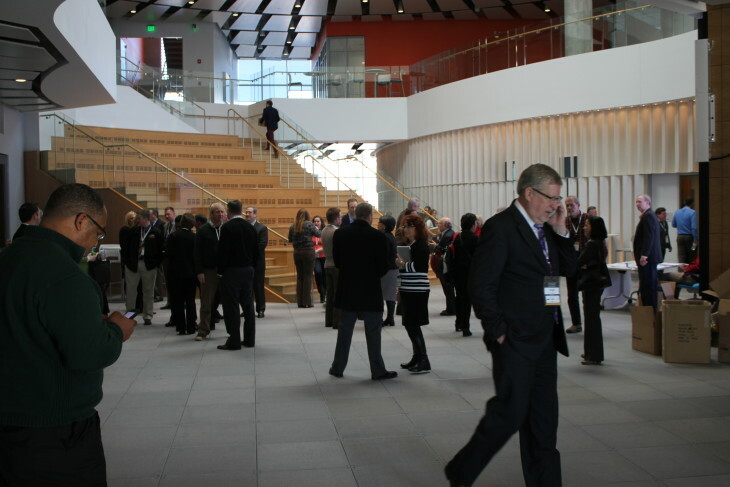 Read EDU track speaker Tom Vander Ark’s blog about the Summit. Read Mike Brown’s blog about Susan Crawford’s masterful keynote Wednesday. I want to bring a delegation, but I don’t have all the names yet. Can I still take advantage of the discount? Absolutely. When you choose to purchase five or more tickets, on the Checkout page, enter your information for each attendee. You may contact us later to enter the correct names. How can I assemble a delegation? Past delegations enjoyed the most success when they worked across geographic, departmental and disciplinary lines. That’s why we’ve optimized the conference experience for cities that bring diverse teams. If you have any questions about registering a delegation or the Gigabit City Summit in general, contact Jason Harper, KC Digital Drive Communications Director atjharper@kcdigitaldrive.org or 816-695-8770. We offer an array of great benefits and flexible packages. Contact Aaron Deacon at adeacon@kcdigitaldrive.org or call 913-475-9885 to start a conversation today.